Sticking to a budget doesn’t mean getting stuck with a dull car. These 14 are “cheap” – their average starting price is $17,100 (and that includes the manufacturers’ destination fees, which average around $795). But they’re also intriguing: sensible sedans, versatile hatchbacks, a hybrid, an all-wheel-drive model, even a six-passenger mini-minivan. We list them alphabetically and include 2014 models and the 2015s just hitting showrooms. If you can stretch your budget a little, we highlight the trim levels that provide more features and power. Chevy refreshes the 2015 version of its underrated Cruze with styling cues taken from the Impala. It also broadens connectivity, adding 4G LTE and available Wi-Fi hotspot features for compatible smartphones to the OnStar assistance service that’s standard on every model. Entry-level LS versions have a just-adequate 138 horsepower. LT, LTZ, and fuel-miser Eco model are turbocharged for more oomph. And the Cruze Diesel is a torque-rich alternative to the Volkswagen Jetta TDI, although at around $26,000 it isn’t exactly cheap. 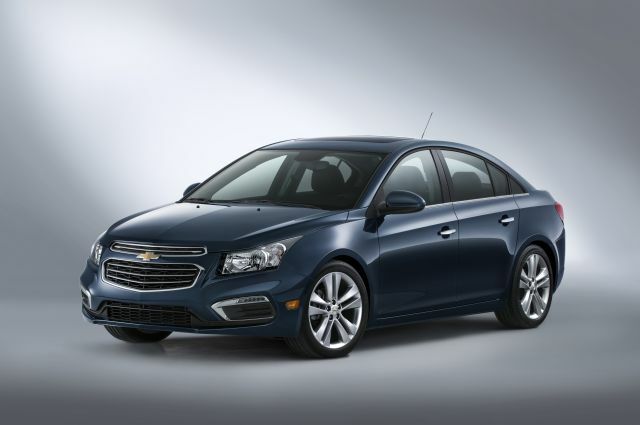 The 2015 changes enhance Cruze’s chiseled looks and put it among the compact-car connectivity leaders. Rear-seat legroom is a bit tight, but the trunk is big and the pleasing ride, handling, quietness demonstrate GM can build a solid compact car.